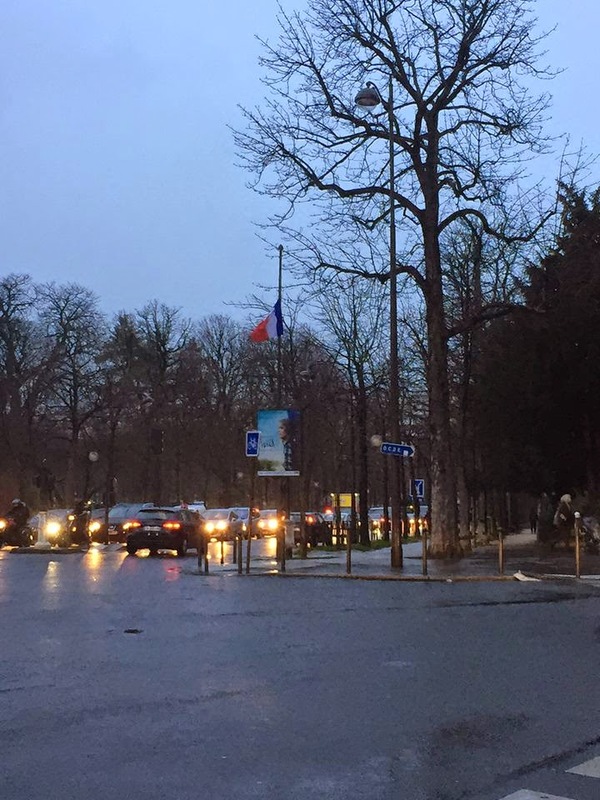 Living in Paris during the Charlie Hebdo attacks (starting January 7th) have been nerve-wracking to say the least. Not only as an American, but as a New Yorker who also lived through the 9/11 attacks, I've been especially on edge. Thankfully, I suppose, I was oblivious to the attacks initially as I was getting my son out from school and taking him home for lunch. It wasn't until shortly before preparing to leave for a playdate when I was notified in quick succession of two messages people left for me on Facebook. They expressed concern for me and my wellbeing...I wondered why they would be mentioning this and thought "what could've happened in Paris?" I went to Google and typed "Paris news" and the results quickly listed the attacks at the Charlie Hebdo offices. Stunned, I wondered if it was safe to go just around the corner for this playdate. I looked out on the street. Quiet as usual. Senior citizens walking calming back with baguettes and other parcels in their hands. Younger mothers with trotinettes heading off after deposing their charges to one of the three private schools on the corner. Traffic, buses, everything seemed normal. I figured I could safely get my son and I to the corner and the playdate without incident and if I saw police activity I could duck into one of a few options. The other mothers at the playdate didn't seem too concerned. However, a family member called me with alarm, obviously because he is seeing American news channels, which are right in the heart of the conflict, and are experts at scare-reporting. Thursday morning all the schools had the red triangle sign indicating Alerte Attentat "red alert", or literally "Alert Attack." Thursday I stayed home for the most part other than taking my child to school. The perpetrators were still at large and even if I live in a "safe neighborhood" I didn't feel like walking around much anyway. I did laundry and parked myself on our sofa, checking out Facebook between finishing a mini-series (The Red Tent, if anyone is interested). was "quiet" until the afternoon. Normally I leave my son in for the after-school activities but this day I wanted to err cautious and get him at 3:00 like many other parents. Turning down his street at the same time as a police car, siren blaring, transported me instantly to 1940s occupied Paris. A man peered after the police from his doorway. I glanced at him and continued, picking up my pace. The policed passed my son's school and my heart-rate went back down from Fearful to just Elevated. I gathered my son, trying to keep my face happy and normal as he excitedly told me about his day, also noticing other parents with worried looks on their faces. We start our walk back home and stopped at our usual bench to eat his gouter (snack). It was after the third police car went past us the wrong-way down a one-way street, siren blaring, that I decided "enough of trying to act casual. Let's get out of here!" I told my son "oh, do you see the police cars? They must be going after a voleur. (thief) Let's get going and we can finish this at home." We walked past a steady stream of students and parents and I realized one of the private schools changed their exit to the other side of their building (the street behind) as part of their Alerte Attentat (Elevated Red Alert) measures. One of our neighbors whose son is in my son's class asked if we heard about the event at Trocadero-- there were people with guns and they'd closed it down. I tried to act casual and minimize any drama in front of my son, who knew nothing about what was happening. At this point, safely home upstairs, I began following the news via Twitter. For the prior two days I'd just looked at Facebook and the posts people made about what was going on. With events possibly occurring in my neighborhood, and nearby Metro stations closing, I needed to know more what was happening. I apologized to my son for obsessively looking at my phone for the next few hours and explained there was some news I was trying to follow. Going into my building that night I thought again about 1940s Paris. I thought how most of my neighbors, while not knowing me, know I'm American. I thought about one neighbor in particular who doesn't like me. And I felt, for a brief moment, like the Jews might've felt back then. Will my neighbor turn me in? Will they report me as American? Are the terrorists interested in finding Americans?....etc. etc. I decided this line of thinking isn't helping me so I switched gears to just generally not feeling safe. My husband came home late Saturday night and I finally began feeling like I could begin letting out the range of emotions and thoughts I had over the past four days. I wondered if, based on the latest US State Department alerts, terrorists would attack churches, what about anglo-saxon churches? I felt, for the first time in my life, scared about going to church. Now I thought about all those thousands and thousands of people who cannot openly worship, or who cannot worship without real fears for their safety. 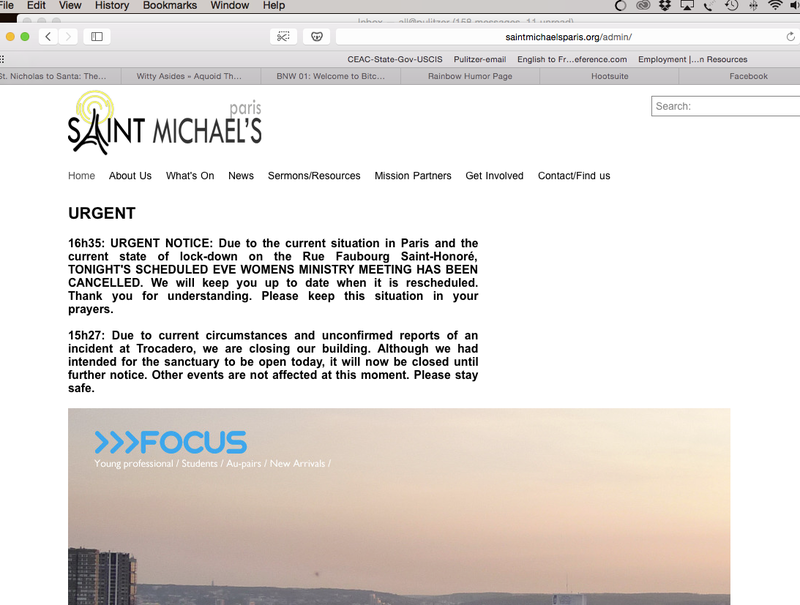 Even my church, which originally posted online that they would be open Thursday and Friday afternoons as a sanctuary for prayer, announced on Friday that they needed to close their doors as well. 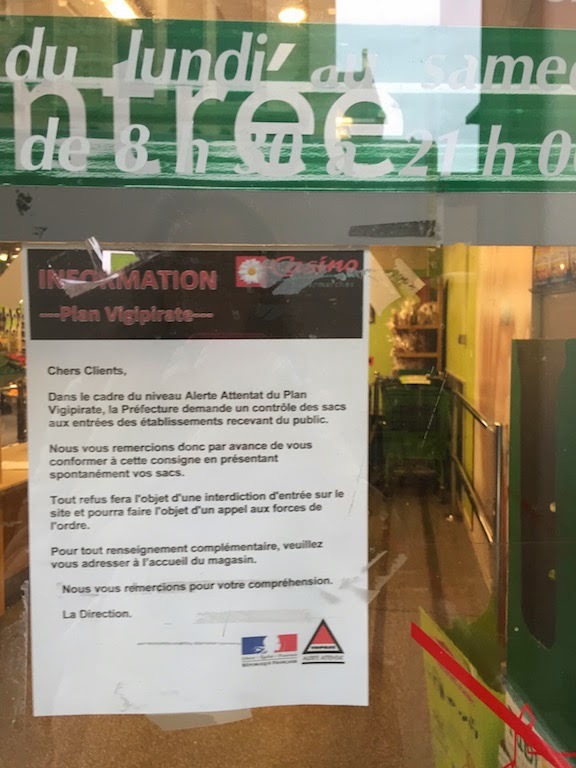 My grocery store (not kosher) put up a piece of paper stating they have the right to, and might, check bags as part of the Alerte Attentat. I was aware of how many times I checked various escape options (doors) throughout my shopping. Fast forward one and a half weeks later, Friday 16 January: my son's school held their annual "Balloon Release" and the night before visions of machine-gun toting vigilantes bursting into the playground invaded my mind. 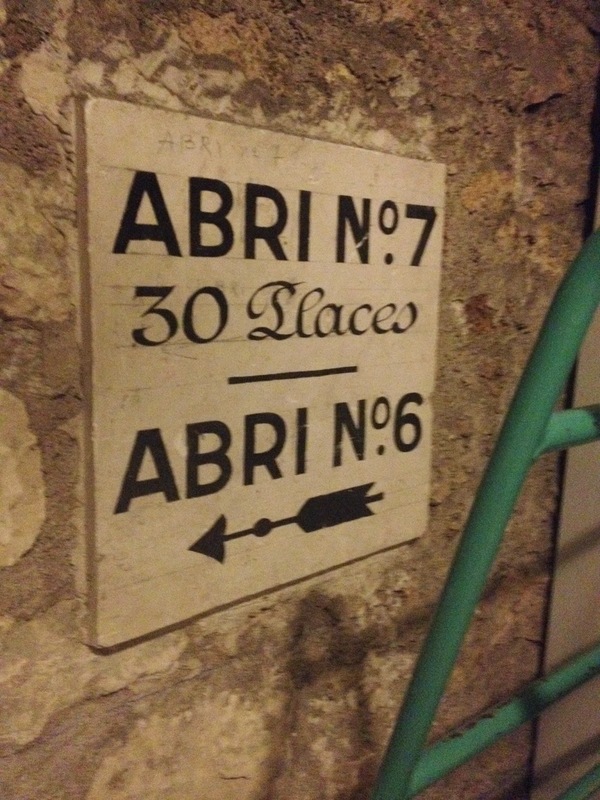 I remembered the underground labyrinth of rooms that were designated during WWII as shelter in case of a bombing. Thankfully, the only screams I heard that morning were of 3-yr olds still scared at being in this new setting called "school," children who'd prematurely released their balloons, children whose balloons popped and other tender childhood traumas that only a mother's kiss or teacher's reassurance could provide. These were quickly drowned out by cries of joy as the directrice rang the old-fashioned bell-on-a-rope signaling the children could finally open their tiny hands and let these instruments of happiness float up to the sky and beyond. The message within this ceremony is explained to the children that like their balloon, they too can go far in life--The Sky's The Limit--with their personal growth throughout their lives. Truly a sweet sentiment, aside from the ecological point of view (which has been debated for many years now). Life in my neighborhood quickly resumed normalcy after the Charlie Hebo events. And while on the outside I'm getting back into the pace of things again, I gather it will take just a little bit of time for me to feel totally free from the fear again. Actually, as I write, the fear is gone...replaced, for now, with just a general heart-ache for our Time, our Days, our World. Knowing it is blessé (hurt), but also blessed.